The inspiration from the current fashion weeks is really the color impact. Earthy orange and gray and brown are such a fresh combination. We did something interesting for a living room project Now, it is time for the kitchen, the heart of the house. Instead of putting cabinet boxes together, we freed up the space and got rid of most of wall cabinets. I specially like the idea that the breakfast table is just in the middle of the kitchen. Ultimately, the kitchen is for use and not for storage. We are all striving for healthy life style and would like to eat the real food when they are fresh with nutrients in peak. With being more conscious in healthy life style, we actually don’t need to have a lot of spaces to install all of the cans and processed food. Therefore, the design for this kitchen is light, airy, fashionable and relaxing. The color palette of orange, brown, gray and blue is truly channel the new colors from the fashion weeks. It’s fresh, chic and have a touch of warmth for the fall. We keep the original architectural details such as moldings and painted all the walls, ceilings and moldings in dark blue to present the originality in a very soft and elegant way. Checked- tile floor—timeless and classy. Tufted brown chairs add a touch of luxury to this streamed line kitchen. 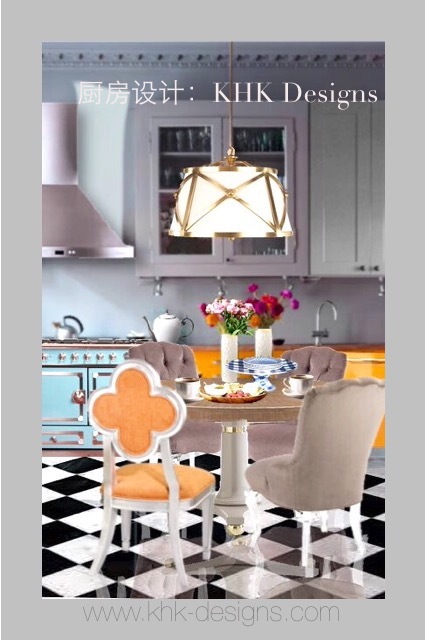 Pop of orange on the cabinets and chair makes the whole space so fashionable. The brass British chanderlier with a cream shade adds another layer of classy. Of course, fresh flowers always make us feel life is so beautiful. Now it is time to make something this fabulous kitchen.